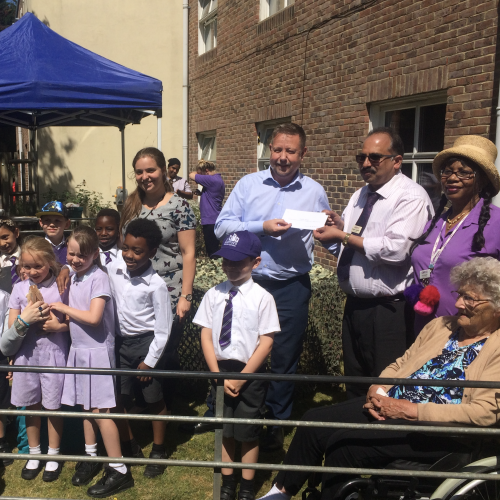 On Wednesday 27th June, Lodge Brothers Yiewsley sponsored an event at Franklin House Care Home. Franklin House invited pupils from two local primary schools to join them for a visit from The Basil & Crew Mobile Farm. Research has shown that the elderly can benefit greatly by having contact with animals. It can reduce blood pressure, lift mood, boost activity levels and reduce stress. The residents and children were joined at the care home by goats, chickens, rabbits, lambs and donkeys. Lodge Brothers District Manager, Adrian Moore, attended the event and presented the Care Home Manager (Mathew V. Mathew) with the donation cheque from Lodge Brothers. The animals thoroughly enjoyed all the strokes and tickles, the residents and children revelled in meeting all the different animals and a great afternoon was had by all.